When I speak of a co-worker, or a co-driver, I'm speaking of a mutual relationship and status (that's simply how the prefix co works in normal English) and I'm pretty sure it's what most people mean too. They are speaking of two pilots who happen to be working as part of the same crew, who are therefore co-pilots (which seems the most correct usage). They mean a pilot who isn't the captain. They mean the pilot monitoring rather than the pilot flying. They think the aircraft has a pilot, and a kind of assistant pilot of lesser abilities known as a co-pilot. Weirdly, I have actually heard air crews use co-pilot in ambiguous ways, as though even they have given up trying to use the word with care; once I heard an announcement in one language that referred to the captain and the first officer, and then immediately afterwards in another to pilot and co-pilot. Does "the co-pilot" have any meaning (note the use of the definite article)? Is co-pilot ever a rank? Does the term appear in aviation regulations? Is it used in crew management policies? Is there indeed any standardised or formal use of it within the industry? Does "the co-pilot" have any meaning? variant of com- before a vowel, h, and gn: coadjutor; cohabit; cognate. The prefix co-, now productively forms new words from bases beginning with any sound ( co-conspirator; co-manage; coseismic), sometimes with the derived sense “auxiliary, subsidiary” ( coenzyme; copilot), and, in mathematics and astronomy, with the sense “complement” ( codeclination). Both sources mention / hint at the co-pilot not being the highest in the command hierarchy. Yes, the co-pilot is the second-in-command (SIC), right after the captain (even if the co-pilot has more hours than the captain—it does happen). If the captain ate the fish, the co-pilot becomes pilot-in-command (PIC). It's very rare (nowadays at least), usually second-in-command will be used. Here's a mention of co-pilot in an FAA advisory circular (not a regulation per se). The Mentor Pilot. A mentor pilot is a professional aviator acting as a coach, co-pilot, teacher, and role model, sharing experience and expertise in the complex environments in which the EA500 will operate. Not really. The terms used are pilot-not-flying (PNF) or pilot monitoring (PM), and pilot flying (PF). Because the captain and co-pilot can be either, they usually swap roles. The captain can be the PF on the out-bound leg, and PM on the return flight, for example. But the captain remains the PIC even when the co-pilot is the PF. 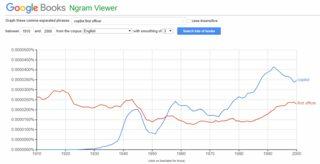 Popularity varies by location / culture / era. First officer (F/O) is also a valid alternative. Searching for jobs on Google, copilot returns ~9 million results, while F/O returns 30 million. 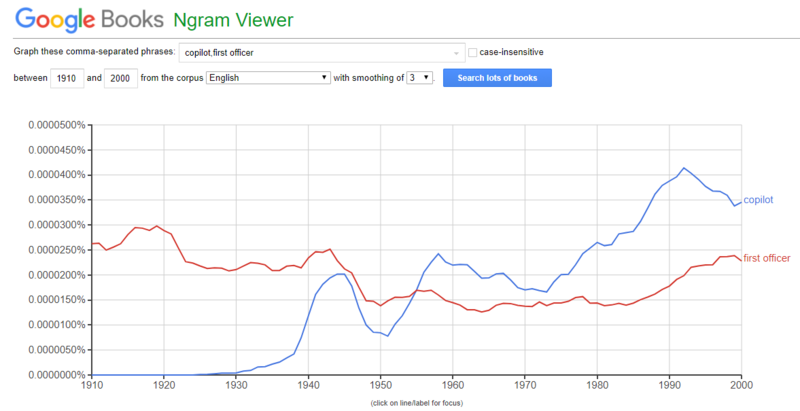 Using Google's Ngram Viewer could be skewed due to the F/O's usage in maritime environments. What is a multi-crew aeroplane? It is an aeroplane that requires a flight crew of at least two pilots. One of them is the pilot-in-command (the captain) and the other is the co-pilot (or first officer). What are common airline crew titles and positions? When does a flight require a copilot? Can two captains fly an airliner? What is a Second Officer? Not the answer you're looking for? Browse other questions tagged pilots terminology or ask your own question. What exactly is a QRH? What exactly is a “drone”? Are “Tally-ho” and “no joy” acceptable ATC terms for civil operations? What exactly are “suitcase handles” in a cockpit? What exactly are “clipped” wings?